Available for the first time as an eBook read by the author! 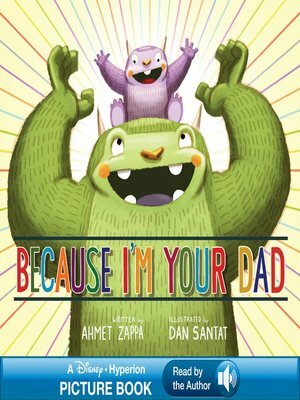 Because I'm your dad, you can have spaghetti for breakfast, French toast for dinner, and rocky road ice cream in the bathtub. In a text that's both playful and loving, a father expresses his hopes and dreams for a one-of-a-kind relationship with his child. Whimsical monster characters bring the silly and sweet scenes to life and keep the book universal. The book's ending, a moving tribute to the author's father, guarantees intergenerational appeal. Because I'm your dad, I will do all of these things for you and more . . . because that's what my dad did for me.